My nephew has a birthday coming up and he is really into Mickey Mouse right now. I decided I would make a card inspired by his favorite character. This was so easy! Take your base and add the Basic Black layer and the Party Animal DSP. Next, stamp "Happy Birthday" in Emerald Envy ink on the whisper white layer. Attach this layer with dimensionals. Now cut a 2 3/8" circle using Layering Circles and then add 2 circles punched from a 1 3/8" circle punch. 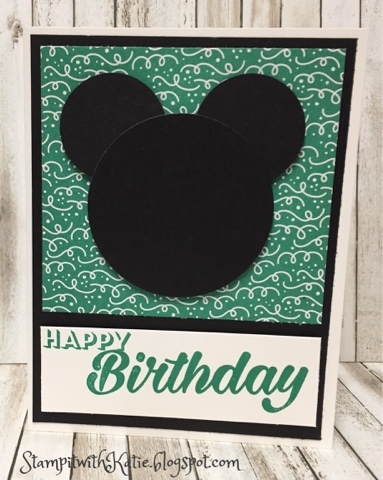 Attach the circles to look like a mouse and then attach to the card front using dimensionals.